One of the most luxurious Bora Bora Overwater bungalow properties, the Four Seasons Bora Bora has been voted the Best Island in the World by U.S. News. The luxury Overwater Villas found at the Four Seasons Bora Bora are uniquely designed with romance in mind. The Four Seasons Bora Bora has some of the most beautiful and spacious overwater bungalows with a minimum 1080 square feet. Check out the 1120 sq. 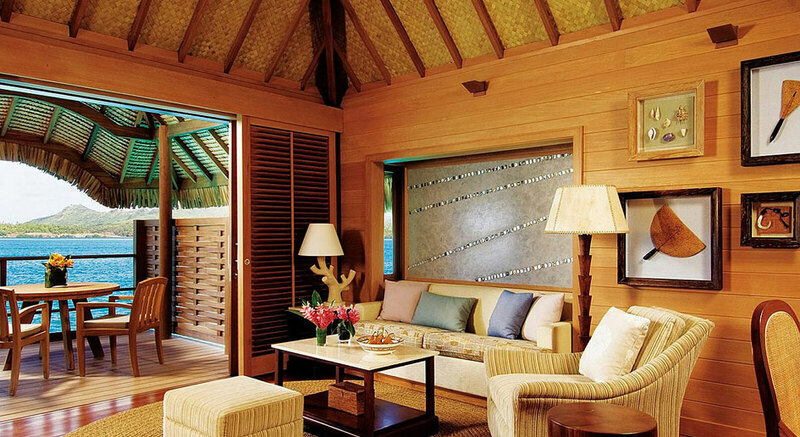 ft. Overwater Bungalow Suite with pool, with an amazing view of Mount Otemanu. As a Virtuoso affiliate, all of our clients will enjoy daily breakfast for two with our compliments. Our Virtuoso affiliation also allows our clients free upgrades (based upon availability on arrival). Meal plans are available should you wish to have those costs covered. Weddings at the Four Seasons Bora Bora are a lovely affair! Ask us for more information. We are experienced in planning Bora Bora Weddings, and would be happy to help you through the process of a French Polynesian Wedding. There are a plethora of amazing activities available at the resort as well as on Bora Bora. The resort offers a Polynesian Show every Monday evening as well as their amazing Canoe Breakfast. Off resort, enjoy a 4×4 excursion, Private lunch, Jet Skiing, helicopter rides and sunset cruises. We can help you to plan every activity. There are a variety of children’s programs offered. Children are welcome at the resort, and most accommodations have plenty of room for the little ones. The Four Seasons Bora Bora is the pinnacle of luxury. Based upon your dates we will send a detailed quotation. Please fill the Request Quote button below to get the process started!